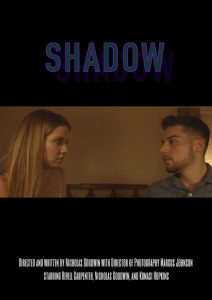 Revell Carpenter gives an impressive performance as Jane, an introverted college student who finds herself somewhat lost within the collegiate dating scene in writer/director Nicholas Goodwin's short film Shadow. It's pretty obvious early on where Goodwin is going with Shadow, though he deserves credit for tackling a difficult, vital subject and doing so in a way that is unflinchingly honest and more than a little challenging to watch. In the film, Jane harbors a crush on Allen (Kumasi Hopkins), who seems to like her but also seems content to keep it all in the friend zone. Jane's confusion is magnified by Allen's having invited her to a party, an invitation extended innocently enough yet an invitation misinterpeted by the socially inexperienced Jane. It is at this party that she encounters Will (played by Goodwin), whose status as the film's bad guy is never in question and who exploits Jane's confusion and, ultimately, her vulnerability. He's an obviously experienced predator. She, sadly, is his perfect victim. I must confess that I often have my concerns about male writer/directors tackling a film such as Shadow, though much to his credit Goodwin gives Carpenter a lot of room to shine and Carpenter does so in a way that is quietly riveting. While the film is in some ways faithful to telling the story through the lens of Jane, on more than one occasion that focus gets exploited which feels, I believe inadvertently, like a repeated victimization of Jane. Shadow's emotional impact is muted, partly due the way the story unfolds and partly due to the inevitable tech challenges of working with a lower budget. The film's sound mix is occasionally muddy, while the film's lighting is such that in certain scenes it negatively impacts the dramatic build-up. Shadow is a decent film, a film made much better by the presence of Carpenter and by Goodwin's desire to be faithful to the uncomfortable truths of this type of story. This is not an easy story to tell nor is it an easy subject to tackle, especially within the confines of a 13-minute short film that demands effective storytelling, dramatic resonance, and bringing the audience through the other side by film's end. While Shadow may not be a perfect film, it's an important one and if you get a chance you should check it out.